A desktop experience that draws you in and keeps you there. This is the idea behind today's iMac. 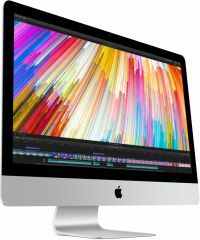 Faster and more powerful than ever, iMac is now equipped with seventh-generation Intel Core i5 and i7 processors and the latest high-performance graphics. To Recieve updates and possible rewards for Apple MNDY2HN/A please sign in. To Recieve updates and possible rewards for Desktop & Mini PC please sign in.